MANCHESTER, NH--(Marketwired - Oct 9, 2013) - Xeros, the innovator of an ultra low water cleaning system, today announced a patented polymer cleaning system for hotels with in-house laundry operations. The Xeros Cleaning System significantly reduces laundry costs, increases the life of linens, and helps hotels advance their commitment to green operations. Sterling Linen Service, one of the largest commercial hospitality laundries located in New England and the Hyatt Regency Reston, Virginia, are both using Xeros' Systems. Xeros will be showcasing the solution at the International Hotel, Motel, and Restaurant Show, November 9-12 at the Jacob K. Javits Center, NYC, Booth #2566. The tourism industry has experienced rapid growth over the past decade and the demand for water and energy resources from the hospitality sector has exponentially increased. As a result, hotels are increasingly adopting green practices to conserve resources, reduce their costs, gain a competitive advantage, gain customer loyalty, and increase brand value. "The Xeros technology is truly amazing," said David Eisenman General Manager at Hyatt Regency in Reston, Virginia. "Xeros has absolutely delivered on the promises of savings and superior performance." According to Xeros' North American President, Jonathan Benjamin, "Revolutionizing the way textiles are cleaned begins with robust science and systems and ends with superior quality and service. In hospitality, helping hotels 'go green' and lowering utility consumption is certainly important, but we believe our technology is only as good as the service and team behind it. 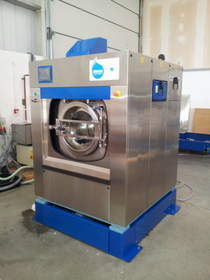 Xeros and its innovative system is truly a step change in the way commercial laundry gets done." Decreased Laundry Costs - By converting in-house laundry operations to a Xeros based polymer washing system, hotels cut laundry costs by up to 50 percent with immediate savings in water, energy, chemicals and support costs through Xeros' innovative care program. Increased Useful Life of Linens - Xeros' polymer cleaning solution routinely out performs aqueous washing methods. Hotels deliver cleaner linens to guests and keep inventory in circulation longer. Longer term savings in areas such as linen replacement are also achieved after extended use. Demonstrated Commitment to the Environment - By converting to a Xeros' polymer cleaning solution, hotels are able to highlight their commitment to the environment and advance their standing as a "green" hotel. Xeros is changing the way textiles are cleaned. Using patented polymer bead technology, the Xeros System for commercial cleaning uses up to 70% less water, 50% less energy and approximately 50% less detergent, and delivers superior cleaning results compared to conventional washing. Xeros was named a top invention by TIME magazine, winner of 'Best Technological Breakthrough' in The Climate Week Awards 2011; listed in World Wildlife Fund's survey of global 'Green Game Changers'; and has been awarded two Rushlight 2013 Awards for green innovation. Strategic partnerships include Green Earth Cleaning and BASF. Xeros is headquartered in the UK with offices in the U.S. and China. For additional information, please visit www.xeroscleaning.com.